LIVE/WIRE is The AC/DC Show – a hugely successful and unique six-man tribute to rock music’s greatest band, complete with cannons, a wall of Marshalls and over two hours of High Voltage Rock ‘n’ Roll in a show critically acclaimed for its closeness in look and sound to the real thing. THIS SHOW IS ALWAYS RAMMED – EARLY PURCHASE ADVISABLE!! Both Bon (Dave) and Brian (Podge) are present on the Rock and Roll train for a night to remember and with the rhythm section ‘locked in’ the freedom of the stage and the music is given to Simon as Angus Young who gives an uncanny performance with meticulous detail in appearance, energy and playing. The band aim to put you slap bang in the middle of the show with hit after hit, and you are expected to join in… and there’ll also be one or two gems thrown in for the aficionados! 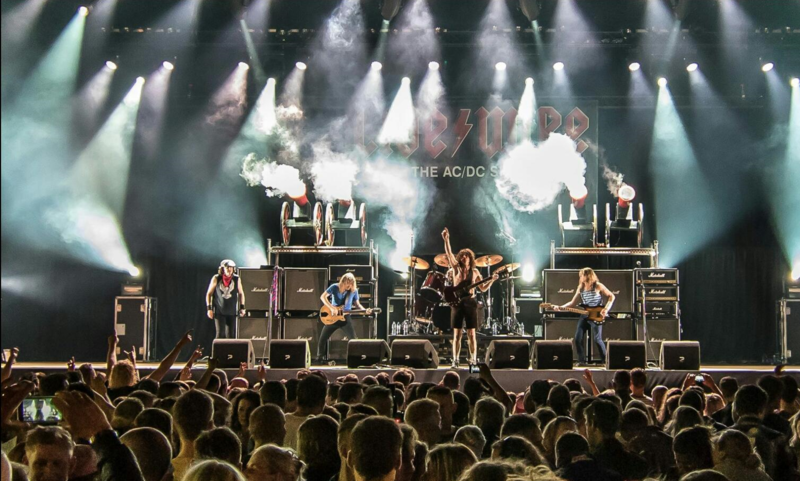 All the classics, Back in Black, Rosie, Highway To Hell are all there, and the songs keep on coming until the cannons fire ceremoniously to bring the evening to a superb crescendo. If by this time you are still standing… we salute you! Long Live AC/DC, Long Live LIVE/WIRE! !